Historical fiction as a whole doesn’t really appeal to me, but I had to read this book after seeing recommendations for it everywhere. As a Southerner, I’m glad I did, but it didn’t quite blow me away as I expected. The story begins with the recounting of how an African woman named Ajarry was ripped from her home and brought to the US to become a slave. This origin is important because it shows how it all began, but the main character of this novel is Ajarry’s granddaughter, Cora. Cora is working on a cotton plantation in Georgia, and has been on her own since the age of ten when her mother ran away in the night without her. Ever since then, she’s been an outcast. So when a fellow slave called Caesar asks her to run with him, she considers it, then agrees. Their journey will bring them to many places, but it will never really stop–because as long as there is a runaway slave, there is someone waiting to catch them and return them to their former life. As a main character, I’m not sure if I would describe Cora as compelling, but she has a quiet strength that is unlike any other I’ve encountered. She’s never one to complain, but as she learns more she begins to question the world and that gives her the courage and intelligence to see that she deserves a far better life than the one she was born into. There are a couple of action scenes that put you on the edge of your seat, but for the most part the story moves along languidly. Cora passes months here or weeks there without anything happening, then time will skip forward until the action begins again. I was torn between wanting more to happen, and enjoying the fact that the sometimes slow pace allows the reader to truly see how much Cora is growing through her encounters with the wider world. As a citizen of the South, I can’t say I read about anything I didn’t necessarily know pertaining to slavery, but a lot of its’ horrors are described in detail in this book, and for that reason it’s not for the faint of heart. It’s one thing to know about what the history books say, and another to hear about accounts of torture that happened to real, named people. 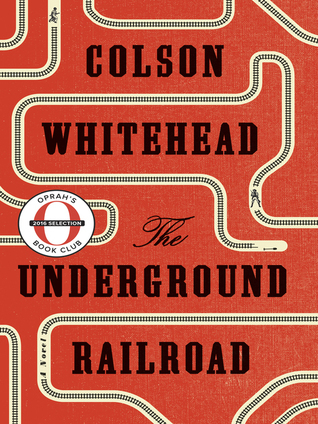 The Underground Railroad was a more introspective book than I anticipated, but I still devoured it pretty quickly. The ending is fast paced and leaves you with some glimmer of hope. Cora’s story is important in the realm of American history, and this novel has the perfect voice to tell it. Colson Whitehead was born in 1969, and was raised in Manhattan. The Underground Railroad, a novel, was published in the summer of 2016. It won the Pulitzer Prize, the National Book Award, the Carnegie Medal for Fiction, and was a #1 New York Times Bestseller. He has received a MacArthur Fellowship, A Guggenheim Fellowship, a Whiting Writers Award, the Dos Passos Prize, and a fellowship at the Cullman Center for Scholars and Writers. Posted on April 17, 2018, in books, reading, review. Bookmark the permalink. Leave a comment.